Disc brakes are not all created equally. Where and how you use them should help you decide on what to buy. Today’s disc brakes typically come in three types: painted or E-coat/ Dacromet coating, or stainless steel. The calipers are made the same, with some manufacturers offering them in aluminum also. If you plan to use them with an electric over hydraulic actuator, you will have to go with one made from steel. 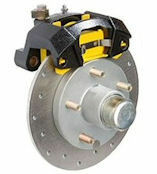 The aluminum calipers may not able to handle the added pressure from this type of system, designed for disc brakes. In fresh water the E-coat will work well, but for a little extra money you can go with the Dacromet coating which should last longer with less maintenance. In brackish or salt water the E-coat offers little protection and is not an option you should consider. There are hybrid kits where the hub and rotor have the Dacromet coating, but the caliper is stainless steel. Being the most important part of the system, this will provide the best caliper available at a reduced cost of an all stainless system. If you use the trailer often in salt or brackish water, going with an all stainless system is your best option. The initial cost may be a bit shocking over the other options, but down the road you will thank yourself for having spent the extra money. Typically the Dacromet or Dacromet/Stainless kits offer a 3 year warranty, where the all stainless kit (offered in both 10″ and 12″ ) will double this and provide a 6 year warranty. If you are tired of working on your trailer brakes instead of being out on the boat, consider going with all stainless disc brakes like what we offer from Kodiak. Having peace of mind in my opinion while towing, is priceless.